With UniTel Voice you get loads of features, you can send and receive faxes, and you get more personalized customer support at a lower cost. It’s a truly compete business phone system. All UniTel Voice plans include unlimited extensions, voicemails, and all phone system features you need to run your business from any phone anywhere. UniTel Voice offers a free professional voice studio recording with every plan and a free one-on-one setup session with a highly knowledgeable account manager to help you get set up fast and easy. 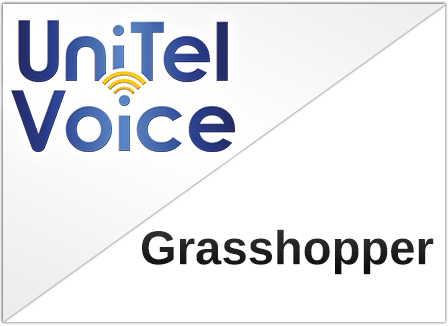 If you’re looking for Grasshopper Competitors, you’ve found one, UniTel Voice. When comparing virtual phone system features and functionality, UniTel Voice is a competitive Grasshopper alternative. It may be hard to determine which is the better virtual phone service based on features and functionality alone, because they’re pretty similar, however, with UniTel Voice you can both send and receive faxes. With Grasshopper, you can only receive faxes, you cannot send them. Pricing between Grasshopper and UniTel Voice is competitive but overall UniTel Voice offers lower cost plans and lower overages. The biggest difference between UniTel Voice and Grasshopper is customer service and support. Both Grasshopper customer support is based in the USA, however UniTel Voice is the only phone company that offers personal one-on-one setup sessions to its customers where we set everything up for you offer a free professional voice recordings with every plan. 1. How does UniTel Voice compare on cost? Where way cheaper than Grasshopper. Period. That’s an easy win for us. However, competing on cost alone is no way to be. So please keep reading below. 2. How does UniTel Voice compete on features? UniTel Voice offers all the features you need to sound professional, stay connected and run your business from anywhere. Grasshopper and UniTel Voice have basically the same features but for some reason Grasshopper doesn’t allow you to send faxes and they charge extra for professional voice recording. We can send and receive faxes and we offer free pro voice recordings. 3. How does UniTel Voice compare on call quality? Both Grasshopper and UniTel Voice have excellent call quality. What gives UniTel Voice an advantage over our many competitors is that you can accept calls on VoIP or Landline or Cell Network or Cell Data. If you have a poor internet connection that doesn’t have to affect your call quality with UniTel Voice. 4. How does UniTel Voice compete on network reliably? 5. How does UniTel Voice compare on customer service and support? At the end of the day, virtual phone systems are pretty similar on features. Yes, design and user experience matters (both Grasshopper and UniTel Voice are leaders in this regard), but the number one thing we’ve done to set us apart is a focus on customer service. Only at UniTel Voice do you get a personal account manager who will jump on a phone call – help set up everything for you and give you virtually unlimited one-on-one customer support. We do this not because it’s scalable but because we see it as an investment in our customers. If you get all of your support needs meet you will stick around longer. While our competitors are automating and outsourcing customer support we strive to stay human.